Take hold of this rugged hand laced edge leather belt, you'll be reminded of your favorite pair of boots. 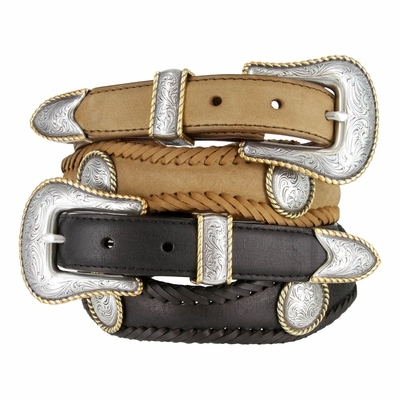 Hand Polished Sterling Silver Gold plated three piece buckle set and Gold Round Rope Edge Conchos made from hand engraved masters. � Hand laced scalloped edge leather belt. 1 3/8" wide tapering to 1" Wide at both ends. � Our belts are measured from where the leather ends at the buckle end to the middle hole at the tip end.